Background: The development of screening instruments will help the primary care team to determine when further comprehensive cognitive assessment is necessary. Design: A retrospective analysis based on medical records. Patients and setting: Patients referred to a comprehensive geriatric assessment unit. Analysis: Cognitive screening and assessment included visual-spatial components: the Mini Mental State Examination, the Clock Drawing Test, the Montreal Cognitive Assessment Test, and the Neurotrax (Mindstreams) computerized cognitive assessment battery. Results: The average age of the 190 eligible patients was 81.09±5.42 years. Comparing the individual tests with that of the visual-spatial index of Neurotrax, we found the Trail Making B test to be most sensitive (72.4%) and the Cube Test to have the highest specificity (72.8%). A combination of tests resulted in higher sensitivity and lower specificity. Conclusion: The use of a combination of visual-spatial tests for screening in neurocognitive disorders should be evaluated in further prospective studies. In a longitudinal archival study,17 it was shown that changes in visual-spatial perception sometimes appear in the preclinical phase of dementia as early as 3 years before the diagnosis of dementia, while memory decline occurs some 2 years before diagnosis. The purpose of this study was to examine whether the use of visual-spatial perception testing (as a component of existing screening tools for the early detection of cognitive impairment) is of value for the determination of cognitive impairment, as compared to the visual-spatial component of a more comprehensive computerized neurocognitive battery used for cognitive assessment. We performed a retrospective analysis based on medical records from the years 2005 to 2010 of patients seen at the comprehensive geriatric assessment (CGA) unit of the Clalit Health Services in Beer Sheva, Israel. The multidisciplinary staff of the CGA unit include specialist geriatricians, geriatric nurses, a dietician, an occupational therapist, a physical therapist, and a social worker. 1) Mini Mental State Examination: The intersecting pentagons were rated as normal (score 1) or abnormal (score 0). 2) CDT as normal (score 2) or abnormal (1 or 0). Scores were allocated as follows: 0 – neither numbers nor hands are present, or they have been placed incorrectly; 1 – the hands are present and they have been placed correctly, and numbers are either missing or incorrectly placed; 2 – both hands and numbers are present and have been placed correctly. 3) Cube Drawing Test component of the MoCA test as normal (score 1) or abnormal (score 0). 4) Trail Making B test component of MoCA test as normal, where all points (letters and numbers) are connected in the correct order (score 1), or at least one point is missed or not in the correct sequence (score 0). 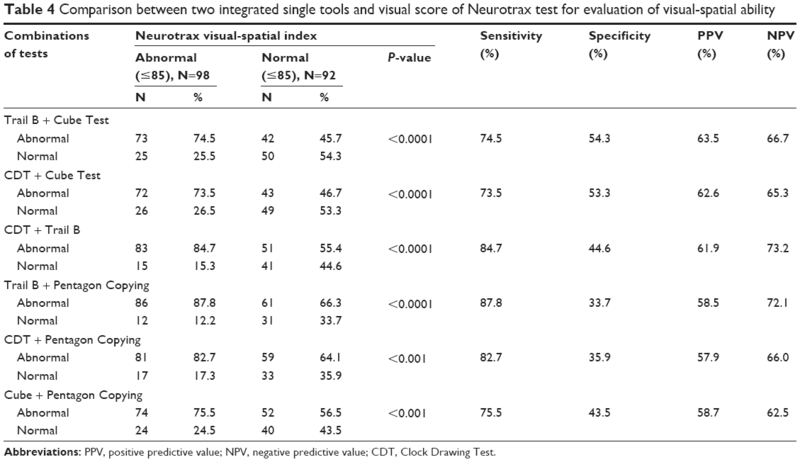 5) Visual-spatial index of the Neurotrax (Mindstreams) computerized cognitive assessment battery (a score of ≤85, representing one standard deviation [SD] below normal was scored as 0, and >85 as 1). The study was approved by the Ethics Committee of Clalit Health Services at the Meir Medical Center. We calculated sensitivity, specificity, positive predictive value (PPV), and negative predictive value (NPV) for each of the measures for determining cognitive impairment. Using the visual-spatial index of the Neurotrax (Mindstreams) assessment battery as the reference,28–30 the other tests were compared both individually and in varied combinations, in order to determine sensitivity and specificity, PPV, and NPV. Chi-square analysis was performed with P<0.05 considered to be statistically significant. A total of 190 patients assessed at the CGA unit over the years 2005–2010 with data available for all the study instruments were eligible for inclusion in the study (Table 1). Abbreviations: SD, standard deviation; MCI, mild cognitive impairment; PHQ-9, Patient Health Questionnaire-9; CIRS-G, cumulative illness rating scale – geriatric version. The average age and SD was 81.09±5.42 years (range: 67–94), and 111 (58.4%) were females. The mean education level was 13.83 years (SD ±10.02). Based on clinical and cognitive assessment, 62 (32.6%) of the patients were determined to be cognitively normal, 90 (47.4%) were diagnosed as having MCI, and 38 (20%) were diagnosed as having dementia. Of those with dementia, 27 (71%) patients were diagnosed with Alzheimer’s disease, nine (23.8%) with vascular dementia, one (2.6%) with diffuse Lewy body dementia, and one (2.6%) with other dementia. The results of the cognitive assessments are presented in Table 2. With regard to the Neurotrax computerized cognitive assessment, a total of 107 (56.3%) subjects scored below one SD from the normal (<85%) on the global score index. For the visual-spatial index, 98 subjects (51.6%) scored below one SD. With regard to abnormal results for the other cognitive tests, the Cube Test was abnormal in 64 subjects (33.7%), the Trail Making B test in 110 (57.9%), the Intersecting Pentagon Copying (IPC) test in 117 (61.6%) subjects, and the CDT was abnormal in 92 (48.4%). Comparing the individual cognitive tests with that of the visual-spatial index of Neurotrax, we found the Trail Making B test to be most sensitive (72.4%) and the Cube Test to have the highest specificity (72.8%) (Table 3). Abbreviations: PPV, positive predictive value; NPV, negative predictive value. The effect of combining two different tests, Trail Making B and IPC, was a higher sensitivity of 87.8%. The highest specificity of combined tests was for Trail Making B test and the Cube Test (54.3%) (Table 4). Abbreviations: PPV, positive predictive value; NPV, negative predictive value; CDT, Clock Drawing Test. When looking at the combined effect of three tests compared to the visual-spatial index, the highest sensitivity was 88.8% for a combination of Trail Making B test, Cube Test, and IPC. This combination also had the highest specificity of 33.7% compared to other multiple combinations of tests. When looking at the combination of all four tests, the sensitivity was 93.9%, and specificity was 27.2% (Table 5). Our results show that tests of visual-spatial function are useful for screening patients for impaired cognitive function. While most screening instruments currently in use include an evaluation of visual-spatial function as one component of the test,24–29 no screening tool is based solely on this aspect of cognitive function. The high sensitivity found for the combination of all four tests that were administered was associated with a low specificity. Our results suggest that when at least one of the tests is abnormal, further cognitive assessment is indicated. The high sensitivity of the combined tests may eliminate the need for further cognitive screening. The time required to administer these four tests varies from 3 to 5 minutes, which is certainly acceptable for screening. These tests are all simple paper-based tests that can be easily administered in the clinic or home setting by nonprofessional staff who have received the necessary training (Table 5). To the best of our knowledge, this is the first such study to evaluate the combined value of screening tests for visual-spatial function in cognitive assessment. The use in this study of the Neurotrax visual-spatial index based on the Block Design of the Wechsler Adult Intelligence Scale-332 as the reference test, as well as the use of a cognitive diagnosis based on a CGA by a multidisciplinary team, strengthens the value of our findings. Our study has a number of limitations. We performed a retrospective analysis based on the charts of patients referred to a single CGA unit in the southern district of Israel. Our patients spoke either Hebrew or Russian as their primary language and were all of Jewish ethnicity. Thus, the generalizability of our results is limited. The choice of a computerized cognitive assessment battery as the gold standard rather than formal neuropsychological assessment is a possible limitation. However, the Neurotrax battery has been well validated in numerous studies.28–30 We realize that many of the tests that we used are not limited to visual-spatial function but that they assess other aspects of cognitive function as well, particularly executive function. The overlap with other cognitive functions may clearly have a confounding effect on our results. We also acknowledge that most conditions causing the dementia syndrome present primarily with memory, language, and executive function deficits, at least initially, and that impaired visual-spatial function in itself does not constitute one of the usual diagnostic criteria (Table 6). Abbreviations: PPV, positive predictive value; NPV, negative predictive value; MCI, mild cognitive impairment; CDT, Clock Drawing Test. The combination of four short, paper-based tests, namely the Trail Making B test, the Cube Test, the IPC test, and the CDT, was found to be highly sensitive (93.9%) for identifying subjects with cognitive impairment, when compared to the Neurotrax (Mindstreams) computerized cognitive assessment battery. 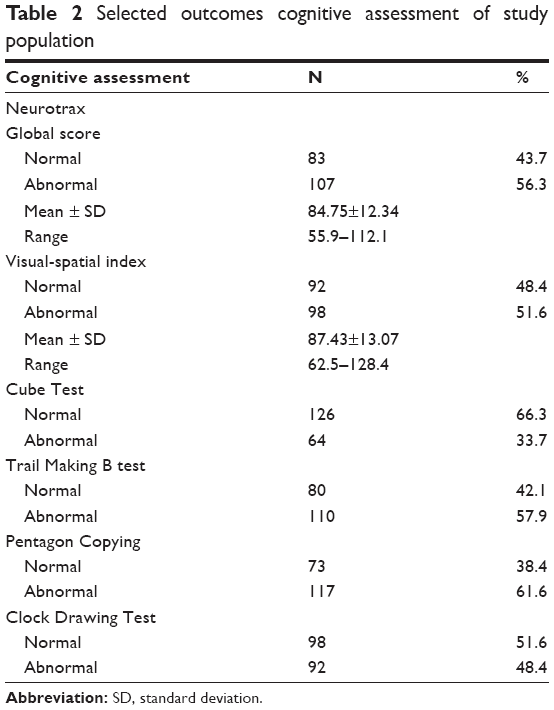 The use of a combination of visual-spatial tests for screening in neurocognitive disorders should be evaluated in further prospective studies. Hebert LE, Scherr PA, Bienias JL, Bennett DA, Evans DA. Alzheimer disease in the US population: prevalence estimates using the 2000 census. Arch Neurol. 2003;60(8):1119–1122. Mitchell AJ, Shiri-Feshki M. Rate of progression of mild cognitive impairment to dementia – meta-analysis of 41 robust inception cohort studies. Acta Psychiatr Scand. 2009;119(4):252–265. Canadian Agency for Drugs and Technologies in Health. Screening Tools to Identify Adults with Mild Cognitive Impairment Not Associated with Dementia: A Review of Diagnostic Accuracy, Effectiveness and Guidelines. 2013. Available from: https://www.cadth.ca/media/pdf/htis/sep-2013/RC0475_Mild%20Cognitive%20Impairment%20Final.pdf. Accessed November 13, 2015. Lin JS, O’Connor E, Rossom RC, et al. U.S. preventive services task force evidence syntheses, formerly systematic evidence reviews. Screening for Cognitive Impairment in Older Adults: An Evidence Update for the U.S. Preventive Services Task Force. Rockville, MD: Agency for Healthcare Research and Quality (US); 2013. State of Israel, Ministry of Health [webpage on the Internet]. The Israel National Program for Prophylaxis and Treatment of Alzheimer’s Disease and Other Dementias. 2013. Available from: State of Israel, Ministry of Health, 2013. http://www.health.gov.il/English/Topics/SeniorHealth/DEMENTIA/Pages/National_program.aspx. Accessed November 13, 2015. Cordell CB, Borson S, Boustani M, et al; Medicare Detection of Cognitive Impairment Workgroup. Alzheimer’s Association recommendations for operationalizing the detection of cognitive impairment during the medicare annual wellness visit in a primary care setting. Alzheimers Dement. 2013;9(2):141–150. Winblad B, Palmer K, Kivipelto M, et al. Mild cognitive impairment – beyond controversies, towards a consensus: report of the international working group on mild cognitive impairment. J Intern Med. 2004;256(3):240–246. Artero S, Petersen R, Touchon J, Ritchie K. Revised criteria for mild cognitive impairment: validation within a longitudinal population study. Dement Geriatr Cogn Disord. 2006;22(5–6):465–470. Busse A, Bischkopf J, Riedel-Heller SG, Angermeyer MC. 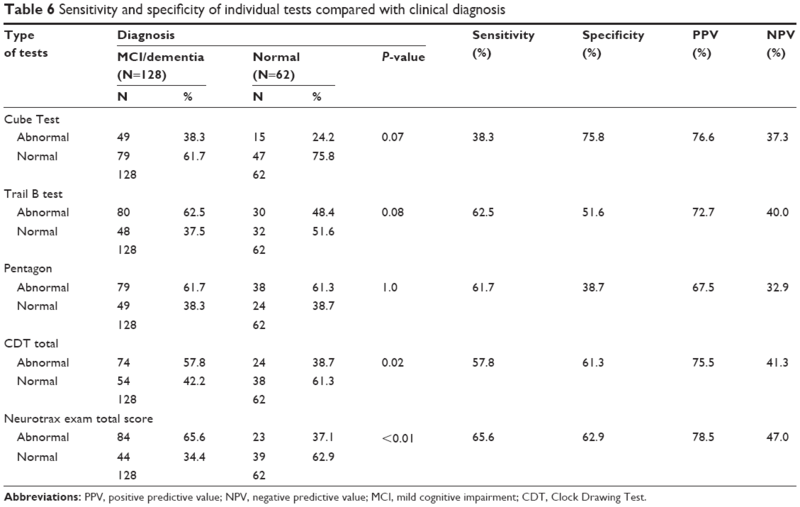 Mild cognitive impairment: prevalence and incidence according to different diagnostic criteria. Results of the Leipzig Longitudinal Study of the Aged (LEILA75+). Br J Psychiatry. 2003;182:449–454. Ward A, Arrighi HM, Michels S, Cedarbaum JM. Mild cognitive impairment: disparity of incidence and prevalence estimates. Alzheimers Dement. 2012;8(1):14–21. Ravaglia G, Forti P, Maioli F, et al. 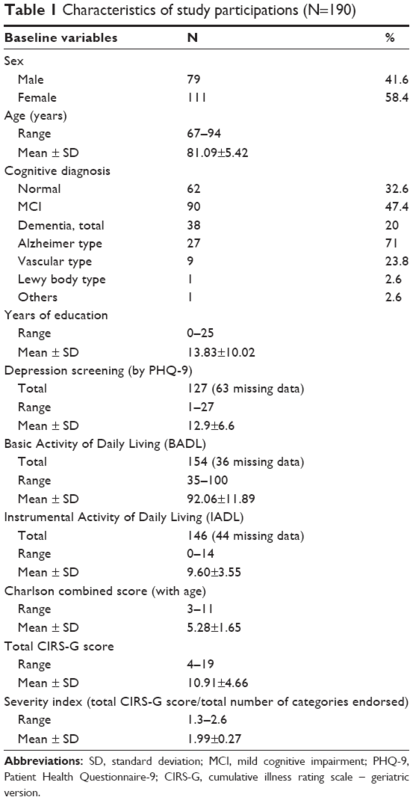 Conversion of mild cognitive impairment to dementia: predictive role of mild cognitive impairment subtypes and vascular risk factors. Dement Geriatr Cogn Disord. 2006;21(1):51–58. Bennett DA, Wilson RS, Schneider JA, et al. Natural history of mild cognitive impairment in older persons. Neurology. 2002;59(2):198–205. Bruscoli M, Lovestone S. Is MCI really just early dementia? A systematic review of conversion studies. Int Psychogeriatr. 2004;16(2):129–140. Johnson DK, Storandt M, Morris JC, Galvin JE. Longitudinal study of the transition from healthy aging to Alzheimer disease. Arch Neurol. 2009;66(10):1254–1259. Wade DT, Collin C. The Barthel ADL index: a standard measure of physical disability? Int Disabil Stud. 1988;10(2):64–67. Doble SE, Fisher AG. The dimensionality and validity of the Older Americans Resources and Services (OARS) Activities of Daily Living (ADL) scale. J Outcome Meas. 1998;2(1):4–24. Charlson ME, Pompei P, Ales KL, MacKenzie CR. A new method of classifying prognostic comorbidity in longitudinal studies: development and validation. J Chronic Dis. 1987;40(5):373–383. Kokmen E, Naessens JM, Offord KP. A short test of mental status: description and preliminary results. Mayo Clin Proc. 1987;62(4):281–288. Korner EA, Lauritzen L, Nilsson FM, Lolk A, Christensen P. Simple scoring of the clock-drawing test for dementia screening. Dan Med J. 2012;59(1):A4365. Nasreddine ZS, Phillips NA, Bédirian V, et al. The Montreal Cognitive Assessment, MoCA: a brief screening tool for mild cognitive impairment. J Am Geriatr Soc. 2005;53(4):695–699. Doniger GM, Zucker DM, Schweiger A, et al. Towards practical cognitive assessment for detection of early dementia: a 30-minute computerized battery discriminates as well as longer testing. Curr Alzheimer Res. 2005;2(2):117–124. Dwolatzky T, Whitehead V, Doniger GM, et al. Validity of a novel computerized cognitive battery for mild cognitive impairment. BMC Geriatr. 2003;3:4. Dwolatzky T, Dimant L, Simon ES, Doniger GM. Validity of a short computerized assessment battery for moderate cognitive impairment and dementia. Int Psychogeriatr. 2010;22(5):795–803. American Psychiatric Association. Diagnostic and Statistical Manual of Mental Disorders. 1994. Available from: http://www.psychiatry.org/psychiatrists/practice/dsm. Accessed November 13, 2015. Silva MA. Development of the WAIS-III: a brief overview, history, and description. Grad J Couns Psychol. 2008;1(1):1–19.